Physical activity is important for children, but sometimes we are uncertain how to make it happen. If you don’t have formal training in physical education, you might feel unsure how to even start! Remember that physical activity doesn’t need to involve elaborate programming. Try adding physical activity into your existing programming. You can sing active songs at circle time or use activities that include movement when learning about shapes, colours, letters and numbers. 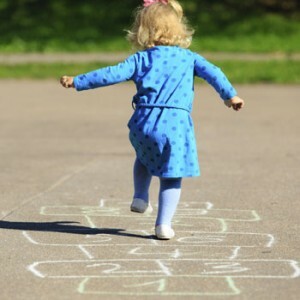 If you program includes outside time, encourage the children to run, jump, skip and hop. Remember that the children in your care depend on you to get active. Set a good example by joining in when the children are playing, sharing stories of your own active lifestyle, and promoting a culture that encourages physical activity. We all have a role in getting children active. Make sure parents know why physical activity is important and how they can facilitate physical activity with their children. Remove chairs so children stand up when colouring or putting together a puzzle. Have an area in the program space designated for physical activity. Have the furniture around the perimeter of the program space so children have room to move around. Have equipment for indoor and small space physical activities readily available such as scarves, fitness dice, and bean bags. Put up posters throughout the space which depict children being physically active. When learning about language you can: integrate letter identification into games and activities, have children make letter shapes using their bodies, use hopping to identify word syllables. When learning about math you can: integrate number identification into games and activities, have children count the repetitions of a physical activity, teach about patterns by using physical activities. When learning about the arts, you can: have children make music with their bodies, act out the parts of an active story, free dance to music. 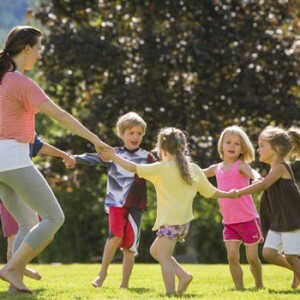 During circle time, use active games or songs such as Simon Says, the Hokey Pokey or Head, Shoulders, Knees and Toes. Set a timer to go off every hour and use this time for a quick energizer such as an active game or song. These activities will not only increase activity levels, they will also help children burn off excess energy which will allow them to focus. Incorporate physical skill development into travel times. For example, encourage children to hop to the washroom, or skip to the craft area when transitioning between classroom activities. You don’t need formal programming. Use the Activities & Games section on this site, and facilitate the activities with your colleagues or on your own. Ask parents if anyone has a special skill they can share with the children. You might have a yoga instructor or soccer coach willing to volunteer their time. Use equipment from the dollar store such as balls, hula hoops and pool noodles. Check out the pet section for amusing toys such as rubber chickens and balls that make noise. Experiment with household or classroom items in place of traditional play items. Examples include sponges, colanders, bed sheets, bins and baskets, tape, and balled up pieces of paper. Use your imagination and get creative! Ask parents to donate equipment that they are no longer using. Build physical activity into your budget. At the beginning of the year, set aside funds that can be accessed for equipment or instructors from time to time. Make sure children are wearing appropriate safety equipment such as helmets for bike riding. Ensure children are wearing proper footwear. Remove any tripping hazards, such as toys and books. Involve the children in this process. Go over safety rules with the children. Involve children in identifying these rules. Ensure activities and physical skills are appropriate for the age of the children. Build up to a harder skill. Shift your perception to value long-term health as well as safety. Ensure parents are aware of the importance of physical activity for their children. Send a letter home or include some information in a newsletter. Provide parents with a list of activity and game ideas. Give them tools to get their children active! Encourage parents to walk or cycle to get around town. At the end of the day, send children home with physical activity ‘homework’. Ideas could be: take a walk outside after dinner or as a family, pick 5 on-the-spot activities and do each one for 1 minute. Check out the downloadable tools we have developed to help inform parents of the issue and provide some ideas. Make physical activity fun. If children are enjoying themselves, they will be more likely to continue to be active and have an interest in being active the next time. Use non-sport specific activities if sports do not appeal to the children. Watch out for signs of fatigue during physical activity and end the activity before the children start losing interest or stop having fun. Vary the activities to maintain the children’s interest. Choose times to be active when the children are well-fed, rested and alert. Encourage children to choose the activity. Encourage children to create their own games and make up their own rules. Encourage children to pick the equipment they want to be active with. Let them choose non-traditional equipment, such as stuffed toys, which will increase the fun. Create opportunities for success through achievable challenges. If children are successful, they will want to continue participating. Limit the amount of screen time children are exposed to. Share information with parents about the negative impacts of too much screen time, and strategies to limit the amount to screen time children are exposed to. Provide opportunities for free play or other unstructured forms of physical activity that aren’t as skill dependent but still promote being active, such as dance or exploring the outdoors. As a role model, provide motivation and build a child’s self-confidence by using encouragement and positive feedback. Do not force a child to perform an activity. Praise children when they are doing things correctly and provide ongoing constructive feedback. Allow children to outperform you so they feel a sense of accomplishment. Remember that learning a new skill takes time. Go slow and gradually increase the time and intensity of the skill. Also provide plenty of opportunities for repetition to learn and practice. If a child is having difficulties with a skill, try teaching it a different way or use different games and activities that use the same skill. Provide diverse and interesting opportunities for skill development through a variety of games and activities. Set realistic expectations for each child and modify skills and activities when necessary. Modify the equipment by using larger, softer balls or shorter, lighter bats and racquets. Choose larger goals and target areas. Also use non-traditional equipment occasionally, such as a stuffed animal, to add a new element of fun and laughter. Make the space smaller to allow more opportunities for success. Children won’t need to travel, throw an object, or kick a ball as far. Alternatively, increase the size of the activity area to allow more children to participate at the same time. Modify games and activities so children gradually progress to desired skills. For example, rather than dribbling a ball with consecutive bounces, start by dropping and picking up an object. Rather than throwing and catching, have children start by passing an object back and forth. Ensure your physical activity environment is inclusive and welcomes children of all abilities. For more information about what this means and tips and modifications for children with different ability levels, please visit our Activities & Games section. Remind yourself that your children depend on you to be active when they are in your care. Understand the benefits of physical activity for children. If you are worried about your skill level, learn with the children! Encourage outside play as research shows that children are more active when they are outside. If your programming permits, take advantage of community resources such as playgrounds, trails, and parks. 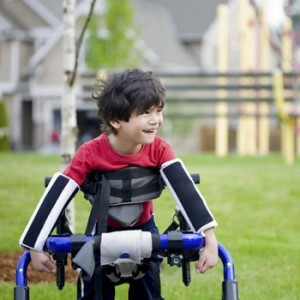 Set-up a specific area that is free from obstacles so children can be active safely. Set-up the space with large pieces of furniture around the perimeter of the room so the interior is for activity. Use furniture that can easily be moved to the perimeter of the room so children have more space to be active. Use the seasons to your advantage and choose weather-specific activities. When it is hot, set up gross motor water play outside. You could also visit your local splash pad or pool. When there is snow, build a snowman, make snow angels, or climb snow mountains. If the weather is wet, jump in puddles or dance in the rain! Ensure children are dressed appropriately for the weather so they will be comfortable in the elements. This includes using ensuring children are wearing sunscreen, are properly hydrated in the heat, and dressed warmly on cold days. Have additional outerwear items for children to borrow in case they have forgotten theirs. You can purchase extra mitts and hats from the dollar store and see if parents can donate old coats, snow pants and boots that their children are no longer using. Have a set of go-to activities that can easily be done inside if the weather is poor. This could include dancing to music, building a fort, or on-the-spot movements. Visit our Activities for some ideas!